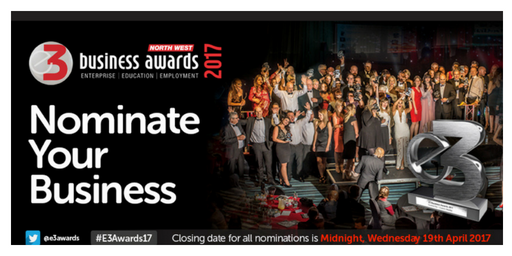 1 Events Media are delighted to announce that the annual E3 Business Awards is now open for 2017 nominations. The E3 Awards are designed to promote diversity, recognising the efforts of entrepreneurs and be truly representative of the business sector across the North West. There will be 18 separate award categories, with entries welcomed from small to medium-sized business, entrepreneurs, charities and social enterprises throughout the North West region. The Awards ceremony will take place at Bolton’s Macron Stadium on Thursday 13th July 2017. 1 Events Media’s Managing Director, Mubarak Chati, said: “Businesses in the North West are showing incredible ingenuity and contribution to both local and regional economies. We want the E3 Awards to celebrate this diversity and all of the amazing things that businesses have achieved. This is now our fifth year of running the E3 Awards and with the event growing year-upon-year, we’re looking forward to a new wave of application nominations. We’d especially love to hear from any businesses who conduct their business in unusual or different ways.